On Tuesday, Spain’s LGBT community leaders were welcomed at the royal El Pardo palace – marking the first time the country's monarchy has ever granted LGBT leaders such a reception. 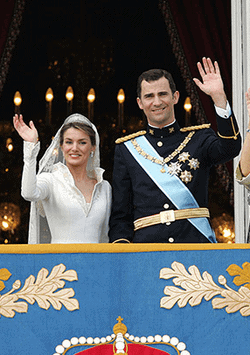 Spain’s newly enthroned King Felipe and Queen Letizia (right) met with Boti Garcia, president of Spain’s State Federation of Lesbians, Gays, Transsexuals and Bisexuals, and José María Núñez-Blanco, president of LGBT rights group the Triangle Foundation - along with representatives of 350 other organizations, The Local reports. García admitted that she had been surprised to receive the invitation, noting: "We have asked more than once for meetings with the vice president of the government and he's never even answered." "We felt that our message had been listened to and understood, " said García. She said that she had asked the queen to defend the human rights of people who may be persecuted for their sexual orientation in countries that the royal couple visit while performing official duties. García added her hope that the meeting would "go beyond mere protocol" and lead the royal couple to adopt a "proactive defence" of human rights.